Courtesy of Bill Welzien, Swim Around Key West, Florida. 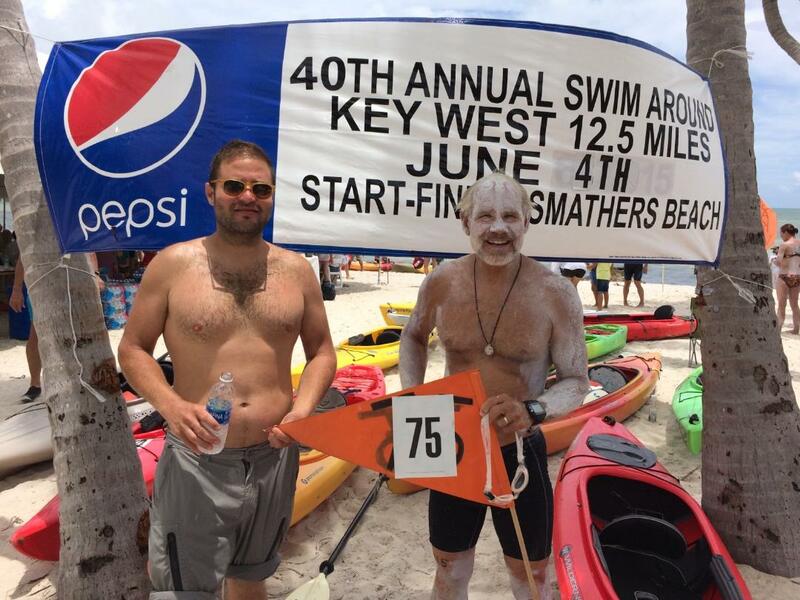 Bill Welzien completed his 75th Diamond Swim in 6 hours 15 minutes on June 4th at the 40th Annual Swim Around Key West. "The days leading up to that 75th Diamond Swim were very hectic [because] that I am [also] the organizer of the annual swim. The swim founder, Anna Fugina, passed this sacred trust into my hands when she moved away about 13 years ago. I accepted this job with the proviso that I could continue to swim the event." So far, his dual role has worked out. "I am very thankful for the competent team who assist me in making this event so successful." The weather and water conditions are always the wild card in the event. "We don’t like wind and we don’t like storms," says Welzien. "We can be diligent to put all the pieces in place, but we have no control over the weather. The Lord granted us a storm-free day and the wind was out of the southeast at about 10-12 mph. That played a minor factor in the swim, but only minor." 106 solo swimmers registered and 86 swimmers showed up on race day along with 13 two-person teams and 19 three-person teams. "Some years back, we introduced a two-wave start. The first group begins 30 minutes before the second. This is designed to give the first group a head start to get through all the critical tidal areas. All finishers receive a finisher’s medal, but the first wavers cannot receive a placement award. It also gets all swimmers through the more heavily trafficked Key West Harbor much quicker." The first wave swimmers started three hours before high tide in the Harbor at 6:30 am and the second wave at two and a half hours before at 7 am. The high tide in the Harbor was 10:33 am, held on a new moon. "The tidal currents were very nice. I was privileged to have my oldest son, David, kayak for me again this year. I received #75 as my race number and we flew our orange pennant on our rented kayak with pride." Welzien uses protective zinc oxide to reduce the harmful effects of the tropical sun. "You want this to be maximum strength 40% zinc and you want it thick so you can’t see through it. The sun was hot and the water was 86+°F (30°C) degrees … pretty warm for the first Saturday in June." Despite the hectic race start when kayakers and swimmers try to find one another, son David found his father right away. "It is assuring to see him next to me and to be right there so quickly. By the time we reach the White Street Pier (3/4 of the first mile), the field is pretty spread out and we are not all on top of one another." Father and son are fluid and coordinated in their feedings. "We make pretty quick feedings with a string with a slip knot around one sport bottle and he refills that bottle from the other pre-mixed bottle in a soft cooler with a zipper rusted from the salt water. In the soft cooler, I have my extra goggles and my SPF lip balm. I have never needed to use those extra goggles, but it’s very important to have them just in case. I also make a big deal about putting lip balm on the lower lip at the pre-race meeting. On the day of the swim I forgot mine so I reached my hand back to the lower part of my back and scooped off some zinc with my finger and applied it to my lip. Welzien has swum around Key West so often, he instinctively knows what pace is good and what the optimal timing of each landmark is. "When I swam under the Fleming Key Bridge at 2 hours 15 minutes into the swim, I was pretty happy. My time under that bridge gives me a pretty good idea of what my finish time will look like. Last year my finish time was about 7 hours 50 minutes, but this year it was about 6:15. The tides and the winds can make a huge difference." Veteran open water swimmers know that all high and low tides are not created equal. "If you hit a head wind in a typically helpful area tide-wise, it can render the benefit null and void." As father and son exited Sigsbee, they hit a head wind. "That meant I would keep my head down and keep a steady pace. I knew the closer I came to the Cow Key Bridge, the wind would effect us less and less. That meant I had about a mile of resistance. I can learn a lot by glancing at my kayaker. Being in the water is in some way easier than sitting on top of it. When I see my kayaker struggling, I know there is something substantial going on. I feel good to see my kayaker laid out on the kayak or being moved forward by the wind. In the best condition, the kayaker is bored silly." Welzien knows the nuances of the circumnavigation like no one else in the world. "It is always a good thing to see the Cow Key Bridge because that is 9 miles out from the start at Smathers Beach. It is also good because you can expect a ride for about a mile out to the Atlantic Ocean. But there is bad with the good. Leaving the Cow Key takes the swimmer into the shallowest water of the event. This calls for a serious alteration of your regular crawl stroke. It can be hard not to drag your chest on the bottom. If your hands go through the weeds, you often feel a tingling from microorganisms that live there. A sense of panic may set, in especially if you didn’t know what was coming. It is about 10 minutes of unwelcomed distress. I pray hard for deeper water. Deeper water does come, but that Atlantic side back to the start line is still uncomfortably shallow. But it’s only 2+ miles to the end of this wonderful ordeal." The last half mile of the 20.1 km circumnavigation of the southernmost point in the continental U.S.A. provides some relief as the water becomes deep enough to take a full, proper arm strokes. "The last half mile is delineated by 10 wooden poles. These poles are there to segregate the beach swimmers from the boat traffic. We swim with the poles on our right hand. I saw a couple swimmers ahead of me and thought to myself, 'I can take him; I can take her.' I had a burst of energy and pulled hard. As I turned around the start pole (now the last pole), I headed into the beach. Normally I start and finish at the same pole [during solo circumnavigation swims], but on the day of the Annual Swim Around Key West, we have a water start and a beach finish. "This makes the finish more interesting for the crowd. I swam hard to the shore and when I ran out of water, I got up and ran through the chute falling at the finish line. Walking muscles and swimming muscles are different and a quick sprint was not what my legs were expecting." Welzien's wife and some of my children and grandchildren were at the finish with his friends and fellow swimmers to acknowledge his #75 career swim around Key West. "It is funny to be greeted by so many enthusiastic people because all my other swims I exit the water and get some peculiar looks from beach patrons who see this man covered with white stuff and never have a clue what I just did." But the global open water swimming community knows well the significance of doing 75 circumnavigation swims of 20.1 km.